Israel’s President Shimon Peres, who celebrated his 87th birthday this week, gets down on the tarmac at Ben Gurion Airport to help greet 85 new recruits to the IDF who arrived on the August 3rd Nefesh B’Nefesh charter flight. 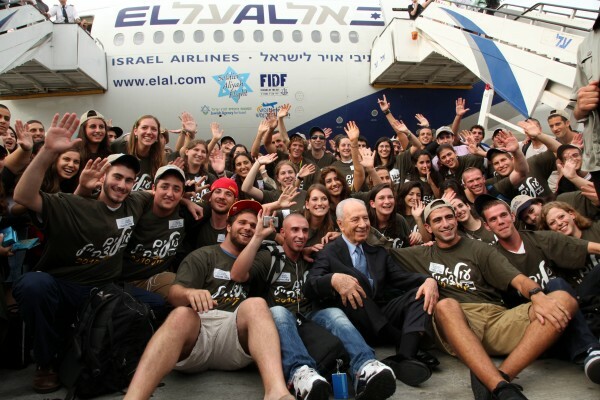 This Nefesh B’Nefesh flight arriving on August 3rd carried a total of 234 new olim to Israel was greeted by President Shimon Peres and hundreds of guests. These olim were among the 3,000 making aliyah with Nefesh B’Nefesh over the course of the summer. Since its founding in 2002, the organization has been responsible for bringing over 25,000 people from the US, Canada and the UK.